We are excited to announced our speaker for November. Her name is Toni Schmidt. Her company is Healing Gardens. If you have been interested in organic gardening but not sure how to go about incorporating it into your gardening practices this talk may be helpful. Toni Schmidt will talk about soil preparation, companion planting, natural insect control and more. She will have a question and answers session after her talk. Members are encouraged to invite guests. We will also have hyacinth bulbs available for those interested in forcing them to bloom. You will need a bulb vase for this. If anyone has an extra vase or two and is willing to spare with other members please bring it to this meeting. It will be fun to add a little color to our homes this winter. They also have a great fragrance. Door prizes, appetizers or desserts are always a hit and appreciated. New members are welcome! MEETING HIGHLIGHTS: We were delighted to have Toni Schmidt give our members an informative presentation on Organic Gardening. She gave us simple home remedies for controlling pests in our gardens, a list of vegetable companions, and a list of resources to help us with any problems we encounter. Great job Toni, THANKS! Heimos Greenhouse Open House: November 21,2010, Sunday. 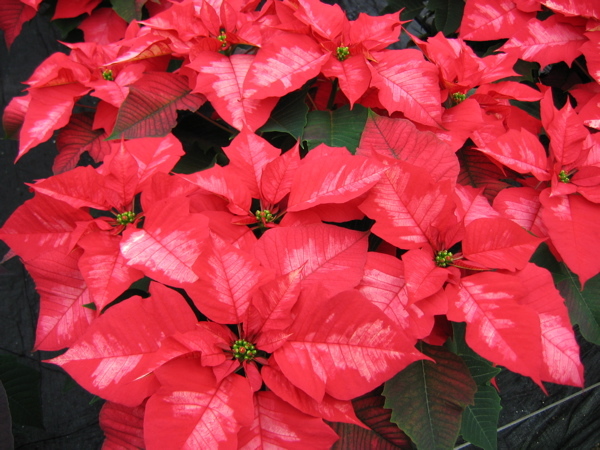 We will be touring the Poinsettia Open House at Heimos Greenhouse in Millstadt, Illinois. Members can invite friends and family to this free event. In past years we have had a great time. HEIMOS HIGHLIGHTS: A small group of members went to the open house this year. It was beautiful to see all of the poinsettia plants in the greenhouse. It seems every year there are more new and improved varieties! We also enjoyed the delicious cookies, apple cider, crafts, and entertainment.